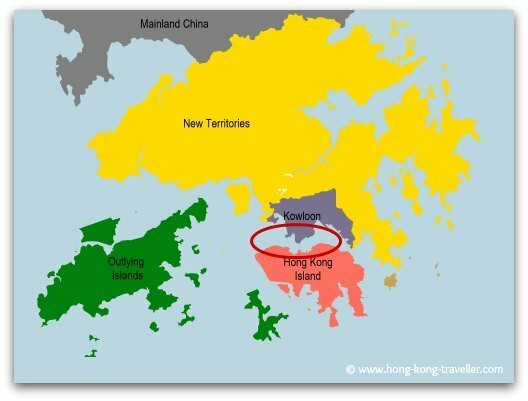 Visitors normally spend most of their time in the northern side of Hong Kong Island and in the opposite shore in Kowloon, (in the red circle above) which are separated by Hong Kong's iconic landmark, Victoria Harbour. These are the most densely populated areas of the territory and where many of the major tourist attractions are concentrated. Here is a more detailed map and description of these popular Hong Kong neighborhoods and what each offers. The New Territories comprise over 68% of the total land area and offer an array of traditional villages and temples and gorgeous protected country parks for nature lovers, with anything from majestic mountains and peaks to the marshes and wetlands teeming with wildlife. If you are arriving by plane, the first place you will set foot will be one of the Outlying Islands, Chek Lap Kok International Airport is located in the island of Lantau. The islands offer yet another glimpse into the character of the city with traditional fishing villages as well as plenty of outdoor activities away from the hustle and bustle of the city. Getting around in Hong Kong is no problem, the public transport system is extremely efficient and economical for big city standards and reaches to all four of the main areas. Here is a brief introduction to each one of them. I would like to encourage you to see them all as they represent such a distinct facet of the Hong Kong landscape, both geographically and culturally, and can give you so many different impressions of life in the Fragant Harbour. 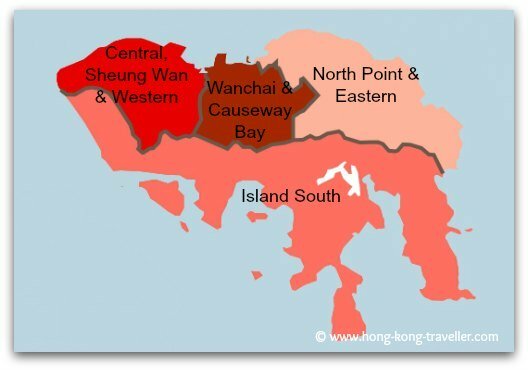 Hong Kong Island covers a mere 7% of the total territory. The northern shore of the island is where the action is. This is the heart of the financial and business district of Hong Kong where ultra modern skyscrapers dominate the scene with Victoria Peak watching over them. In contrast, only a few miles away to the south, lie laid-back coastal towns, quaint fishing villages, beaches and vast open areas. Central, Western and the Mid-Levels: A very compact and dense area, banks and trading houses occupy the skyscrapers that define Hong Kong's skyline. 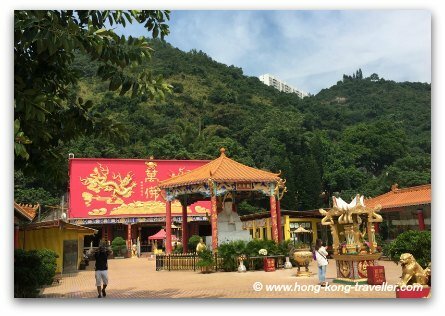 Amongst that jungle of concrete, you find traces of Hong Kong's colonial past, as well as traditional markets tucked in the narrow alleys, and a fantastic green oasis... Hong Kong Park, the city's lungs. Go further up and there's Victoria Peak overlooking the harbour. And on the waterfront, a fantastic promenade takes you along that famous skyline. 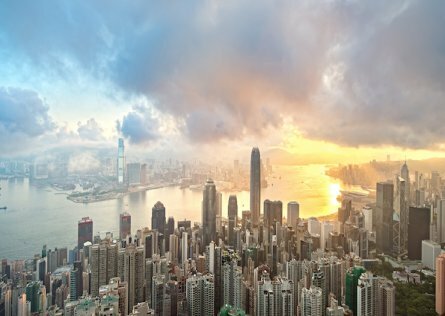 Wanchai and Causeway Bay: To the East of Central, this district has some of the best shopping centers in the city, also home to the Convention Center and the Happy Valley Race Course. North Point and the Eastern District: This is a mostly residential area and contains a mix of new luxury developments and older Chinese buildings. Everything else, mostly to the south: The southern district offers quite a different perspective and more open spaces. Definitely a change of pace from the hustle and bustle of the city. Here you find fishing villages, coastal towns and markets, superb hiking and beaches. The new MTR Island South line has opened, making the area more easily accesible. 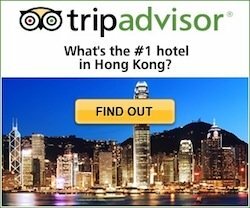 What's in Hong Kong Island? Tsim Sha Tsui and Tsim Sha Tsui East are at the very core of it. There's of course the bustling and gaudy Golden Mile in contrast to the chic and dashing vistas of the Promenade. Electronic stores, tailors, bars and restaurants and some of Hong Kong's best museums and galleries are to be found here. Sham Shui Po is is one of the few remaining working class neighborhoods in the center of town. It is known for its street market for electronic devices, small family businesses that have been around for generations and a fantastic street food culture. Sham Sui Po is home to the original Tim Ho Wan, the Michelin Star dim sum restaurant, which is probably what put this area in the foodie map. Wong Tai Sin and Diamond Hill further to the north as you head towards the New Territories. A bit out of the way, but great for a day outing to escape the melee of the city. This area has lovely gardens and traditional temples. New Kowloon / Kowloon East comprises the area to the east where the old Kai Tak airport used to be. This is a mostly residential area and where the locals shop, eat, pray and play. A new Cruise Ship Terminal has just opened although most of the cruise ship traffic still departs from Ocean Terminal. West Kowloon is the newest area and all from reclaimed land. The reclamation effort which started towards the end of the century, increased the area of the Kowloon Peninsula by 30% and was part of a series of projects in connection with the Airport Infrastructre Programme to connect Lantau Island with the Peninsula. West Kowloon is home to Hong Kong's highest building, the ICC tower. Construction of the West Kowloon Cultural District is underway and will include a modern art museum, theatres and other entertainment venues. 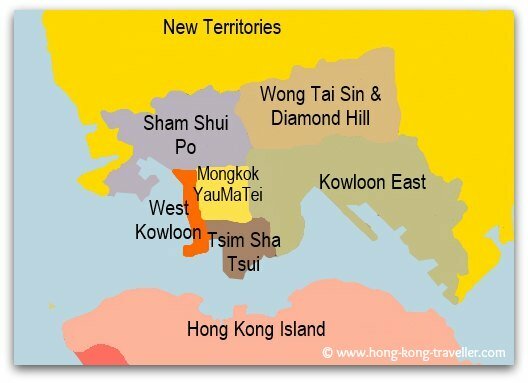 The New Territories make up more than two-thirds of the land, it fans out from the Kowloon peninsula upwards until the border with Mainland China. Beyond the urban sprawl of the previous two areas, the New Territories offer a refreshing and totally different perspective for visitors. There are large expanses of green and lush forests, reservoirs and bird sanctuaries, waterfalls, beaches, fishing villages, the marshes and the sparkling waters of the bays. There's also the century old temples and the historical villages. 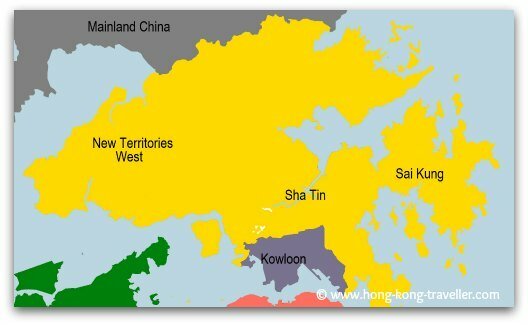 What's in the New Territories? Technically, the Outlying Islands are part of the New Territories, but for practical purposes we set them on a separate category. Although there are more than 260 islands in the territory only a few are inhabited, and some sparsely populated. The Outlying Islands offer some of Hong Kong's best beaches, rugged terrain and greenery, fresher air, quiet fishing villages, and are great for an escape from the hustle and bustle of the city. There's wilderness trails, sampan rides, dolphin watching, and even Mickey Mouse! 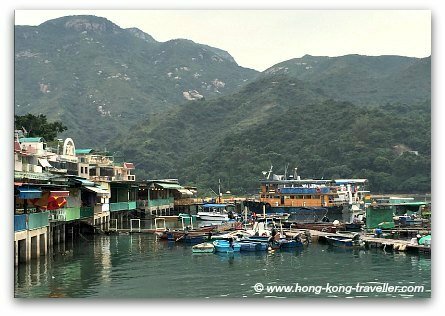 They are all easily interconnected with Hong Kong's ample ferry services and a day or half-day outing is easily done. 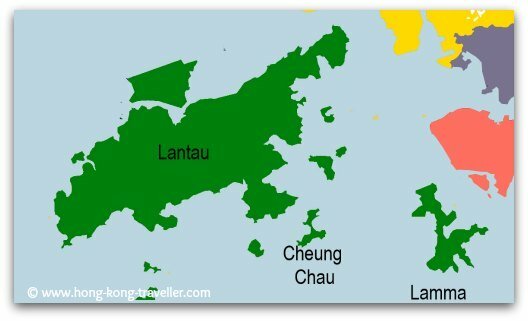 Lantau is the largest of the islands, larger than Hong Kong Island and very easily reached with the MTR, a number of buses and ferries. What's in the Outlying Islands?